Combining attention to lived experience with the critical tools of ethics, Karey Harwood explores why many women who use high-tech assisted reproduction methods tend to use them repeatedly, even when the results are unsuccessful. With a compassionate look at the individual decision making behind the desire to become pregnant and the use of assisted reproductive technologies (ART), Harwood extends the public conversation beyond debates about individual choice by considering the experiences of families and by addressing the broader ethical problems presented by these technologies. Incorporating the personal narratives of women who are members of RESOLVE, the nation's leading organization for people who are infertile, Harwood demonstrates that repeated unsuccessful attempts to use ART may ironically help women come to terms with their infertility. Yet ART is problematic for a number of reasons, including the financial, physical, and emotional costs for women and their families as well as the effects of these technologies on the health and well-being of the children conceived. Issues such as consumerism, workplace norms that encourage delayed childbearing, and narrow definitions of family all come into play. By considering both emotional and ethical dimensions, Harwood offers a humanistic account of infertility and its resolution in a twenty-first-century American context. Karey Harwood is associate professor of philosophy and religion at North Carolina State University. 1. 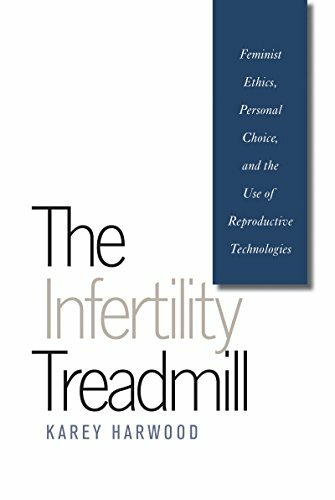 Infertility Treadmill: Feminist Ethics, Personal Choice, & the Use of Reproductive Technologies.